Elementary eights are a family of maneuvers in which each individual maneuver is one that the airplane tracks a path over the ground similar to the shape of a figure eight. There are various types of eights, progressing from the elementary types to very difficult types in the advanced maneuvers. Each eight is intended to develop a pilot’s flight control coordination skills, strengthen their awareness relative to the selected ground references, and enhance division of attention so that flying becomes more instinctive than mechanical. Eights require a greater degree of focused attention to the selected ground references; however, the real significance of eights is that pilot must strive for flight precision. Elementary eights include eights along a road, eights across a road, and eights around pylons. Each of these maneuvers is a variation of a turn around a point. Each eight uses two ground reference points about which the airplane turns first in one direction and then the opposite direction—like a figure eight. Further development of the pilot’s skill in maintaining a specific relationship between the airplane and the ground references. Improving the pilot’s ability to divide attention between the flightpath and ground-based references, manipulation of the flight controls, and scanning for outside hazards and instrument indications during both turning and straight-line flight. Developing the pilot’s skills to visualize each specific segment of the maneuver and the maneuver as a whole, prior to execution. Developing a pilot’s ability to intuitively manipulate flight controls to adjust the bank angle during turns to correct for groundspeed changes in order to maintain constant radius turns and proper ground track between ground references. Eights along a road is a ground reference maneuver in which the ground track consists of two opposite 360° adjacent turns with the center of each 360° turn and the adjacent turn point perpendicular or parallel to the straight-line ground reference (road, railroad tracks, fence line, pipeline right-of-way, etc.). [Figure 6-7] Like the other ground reference maneuvers, its objective is to further develop division of attention while compensating for drift, maintaining orientation with ground references, and maintaining a constant altitude. Although eights along a road may be performed with the wind blowing parallel or perpendicular to the straight-line ground reference, only the perpendicular wind situation is explained since the principles involved are common to each. The pilot should select a straight-line ground reference that is perpendicular to the wind and position the airplane parallel to and directly above the straight-line ground reference. Since this places the airplane in a crosswind position, the pilot must compensate for the wind drift with an appropriate wind correction angle. The following description is illustrated in Figure 6-7. The airplane is initially in a crosswind position, perpendicular to the wind, and over the ground-based reference. The first turn should be a left turn toward a downwind position starting with a steeping bank. When the entry is made into the turn, it requires that the turn begin with a medium bank and gradually steepen to its maximum bank angle when the airplane is directly downwind. As the airplane turns from downwind to crosswind, the bank angle needs to be gradually reduced since groundspeed is decreasing; however, the groundspeed only decreases by 1⁄2 of its velocity during the first 2⁄3 of the turn from downwind to crosswind. The pilot must control the bank angle as well as the rate at which the bank angle is reduced so that the wind correction angle is correct. Assuming that the wind is coming from the right side of the airplane, the airplane heading should be slightly ahead of its position over the ground. When the airplane completes the first 180° of ground track, it is directly crosswind, and the airplane should be at the maximum wind correction angle. As the turn is continued toward the upwind, the airplane’s groundspeed is decreasing, which requires the pilot to reduce the bank angle to slow the rate of turn. If the pilot does not reduce the bank angle, the continued high rate of turn would cause the turn to be completed prematurely. Another way to explain this effect is—the wind is drifting the airplane downwind at the same time its groundspeed is slowing; if the airplane has a steeper than required bank angle, its rate of turn will be too fast and the airplane will complete the turn before it has had time to return to the ground reference. When the airplane is directly upwind, which is at 270° into the first turn, the bank angle should be shallow with no wind correction. As the airplane turns crosswind again, the airplane’s groundspeed begins increasing; therefore, the pilot should adjust the bank angle and corresponding rate of turn proportionately in order to reach the ground reference at the completion of the 360° ground track. The pilot may vary the bank angle to correct for any previous errors made in judging the returning rate and closure rate. The pilot should time the rollout so that the airplane is straight-and-level over the starting point with enough drift correction to hold it over the straight-line ground reference. Assuming that the wind is now from the left, the airplane should be banked at a left wind correction angle. After momentarily flying straight-and-level with the established wind correction, along the ground reference, the pilot should roll the airplane into a medium bank turn in the opposite direction to begin the 360° turn on the upwind side of the ground reference. The wind will decrease the airplane’s groundspeed and drift the airplane back toward the ground reference; therefore, the pilot must decrease the bank slowly during the first 90° of the upwind turn in order to establish a constant radius. During the next 90° of turn, the pilot should increase the bank angle, since the groundspeed is increasing, to maintain a constant radius and establish the proper wind correction angle before reaching the 180° upwind position. As the remaining 180° of turn continues, the wind becomes a tailwind and then a crosswind. 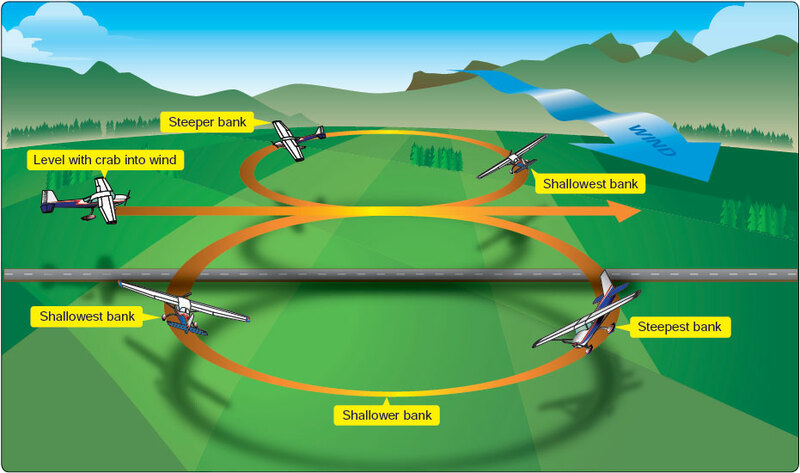 Consistent with previous downwind and crosswind descriptions, the pilot must increase the bank angle as the airplane reaches the downwind position and decrease the bank angle as the airplane reaches the crosswind position. Further, the rate of roll in and roll out should be consistent with how fast the groundspeed changes during the turn. Remember, when turning from an upwind or downwind position to a crosswind position, the groundspeed changes by 1⁄2 during the first 2⁄3 of the 90° turn. The final 1⁄2 of the groundspeed changes in the last 1⁄3 of the turn. In contrast, when turning from a crosswind position to an upwind or downwind position, the groundspeed changes by 1⁄2 during the first 1⁄3 of the 90° turn. The final 1⁄2 of the groundspeed changes in the last 2⁄3 of the turn. To successfully perform eights along a ground reference, the pilot must be able to smoothly and accurately coordinate changes in bank angle to maintain a constant radius turn and counteract drift. The speed in which the pilot can anticipate these corrections directly affects the accuracy of the overall maneuver and the amount of attention that can be directed toward scanning for outside hazards and instrument indications.